Did you know that Tuscans are sometimes nicknamed "mangiafagioli" or "bean eaters"? 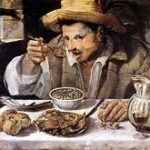 Indeed, there are many wonderful Tuscan bean dishes like fagioli al fiasco, fagioli all'uccelletto, fagioli e tonno, not to mention those wonderful hearty soups like ribollita. But as we all know, Tuscan cooking has much, much more to offer: pappa al pomodoro, pappardelle sulla lepre, la bistecca alla fiorentina, cacciucco, fettunta, crostini, panzanella... the list is practically endless. 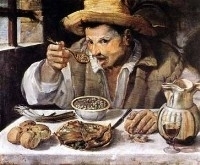 Here's a group dedicated to exploring all the many culinary delights of the birthplace of the Renaissance.